Essential plot rundown: A girl who looks really young for her age discovers a secret past. So I just saw this and I am torn about how I feel. There were some good things and some things that really bothered me. So, because of this, I will be talking about specific things and there will be spoilers. But they won't come till later and I'll warn you. Ok, let's start with the good. I really like the beginning. The opening sequence was pretty sweet. It totally seemed like something that would happened in Texas during the 70s. It recaps the events (mainly the deaths) of the original film and then depicts what happened immediately after. And the film itself was scarier than I was anticipating. There were some good jump scares and a scene or two that was kind of tense. But that is about all that is good about it. Ok, now on to the bad. *SPOILERS* In the beginning they pick up a hitchhiker. But the whole picking him up part didn't feel natural. It seemed really forced. Then they leave him (who they've only know a few hours) alone in the house; he then proceeds to steal their stuff. I mean, really? You're going to leave a complete stranger alone in your house? No one is going to stay behind to supervise? Then there is this stupid cop. He follows a trail of blood down to the basement where (obviously) he is subsequently murdered. I can understand a cop, who stumbles upon a random trail of blood, following it to investigate. But here, he knows Leatherface is out and about killing people. And he is using facetime to show the sheriff and mayor what is going on. Why does he go down by himself? Why don't they send back up? They know he is there and dangerous. But, if you could get past his stupidity, it is a pretty intense scene. And throughout the whole movie, there are things that foreshadow the protagonist's tendencies to be like her family. At the end, she sides with her "cuz" even after seeing him murder all of her friends! She doesn't even know him. And the cop lets him go? 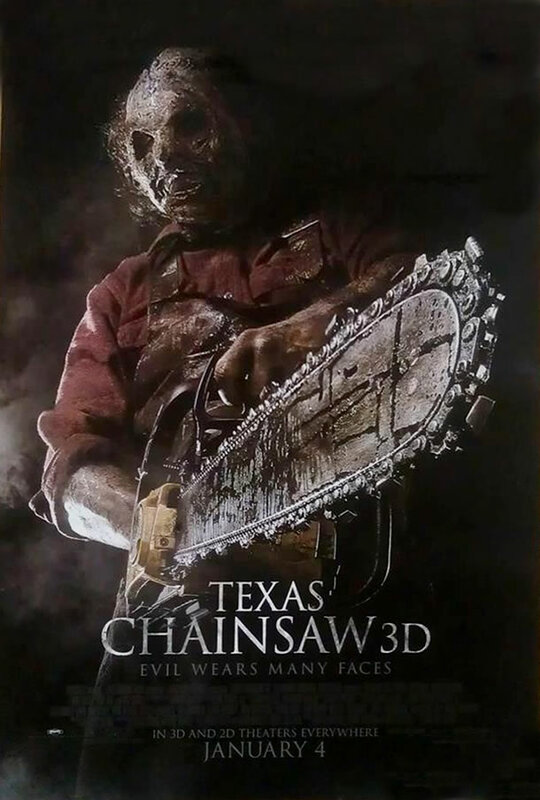 Why doesn't he arrest Leatherface for murdering at least 8 people? Leatherface and the girl just move in together like nothing happened. WTF? One last thing. In the original, there is Leatherface and like 3 other people in the house. But, in Texas Chainsaw 3D, which literally begins 5 minutes after the original, there are suddenly 15 people in the house. Were they just hiding in the back room? *END OF SPOILERS* And this movie, obviously, is a lot gorier than the original. But, I feel that less is more. I'm personally not a big fan of blood and I think it can be just as scary without showing everything. And for some reason, our female friend likes to reveal as much midriff as possible. Somebody gives her a button-up shirt and she only uses the two buttons around her bosom? I don't think showing off her body will stop anyone from killing her. Overall, it is an ok movie. I thought it had a decent amount of scares in it to make it worth watching; but I had a lot of problems with it. There were too many people doing stupid things. I didn't like how Leatherface was portrayed. And the main character's arch didn't make any sense.